Nutritional yeast is a food product that you get in the market. It has a nutty cheesy flavor. It is ‘deactivated yeast’ and you get it in the form of flakes and also as a yellow powder. This is a favorite with people who follow a vegetarian diet. They include it as an ingredient in many of the recipes and also as a condiment. It has the same flavor as that of cheese when we add it to any food. People often sprinkle nutritional yeast on cornflakes, pasta, sauce and garlic bread to increase their taste and flavor. Along with its great taste, nutritional yeast is also rich in various essential vitamins and proteins that are needed for a healthy body. How to make Nutritional Yeast? You get nutritional yeast from cane molasses and beet that have been under the process of fermentation for about a week. The yeast thus obtained is then dried and packed as flakes or in the form of powder. Often you may get confused between baker’s yeast, nutritional yeast and brewer’s yeast. Baker’s yeast help in making the bread rise while brewer’s yeast is obtained as a by product of brewing beer. These two yeasts are very much different form nutritional yeast. It is a source of all B complex vitamins, except B12. Nutritional yeast is fungus like mushroom. It needs bacteria in order to produce B12. Nutritional yeast has got many health benefits. So, many people use this as a topping instead of using parmesan cheese. You can also add this to other food items like popcorn, pizza, pasta, soup and so on. Hardly anybody knows that nutritional yeast has anti-aging properties also. It is full of nucleotides that help have the ability to reverse the aging process. These nucleotides help in rejuvenating DNA and RNA, which are responsible for genetic makeup of the body. They rejuvenate your body and make you look young from inside. As a result, your skin will look younger and healthy, without any wrinkles, fine lines or age spots. The broken cell walls nutritional yeast provides you with beta glucans. They have a major role in making your immune system strong. They form a barrier for the body and protect you from various infections of fungi, virus and bacteria. They also protect you from cancer. So, having nutritional yeast is an excellent way to stay free from diseases. The presence of beta glucans in nutritional yeast is also good for protecting you from diseases of the coronary artery. This is because they help in reducing the levels of LDL, the cholesterol that is bad for the body, and increase the levels of HDL or good cholesterol. Nutritional yeast is regarded as a power pack food and is excellent for your health. One ounce of this powder contains 70 calories, more than 7 gm of fiber and 14 gm proteins. One serving of this food product provides you with vitamins, proteins, biotin, amino acids, folic acids and minerals. Zinc, selenium, phosphorous, iron, magnesium and chromium are some of the minerals you get form nutritional yeast. You can hardly find any other vegetarian source that is a store house of proteins, vitamins, minerals and amino acids as nutritional yeasts. All these are very much needed for a healthy and strong body that is free from diseases. 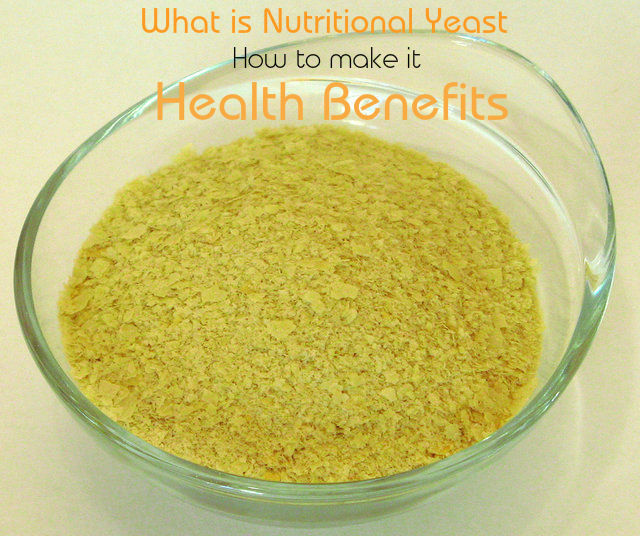 Nutritional yeast is a rich source of glutathione. So, when we consume nutritional yeast, the glutathione present in it gets transformed in to glutathione peroxide as it reaches inside your body. This is an antioxidant and is essential for helping your body fight against the free radicals. As a result, you can reduce the risk of heart diseases, poor vision and cardiac issues by consuming nutritional yeast regularly. It is also good for solving hair loss problems. In some soups and sauces you can use it instead of cream to thicken them. This makes soups and sauces delicious and healthier. Whether you have a toast or a sandwich, sprinkling nutritional yeast on top with olive oil tastes delicious. You can also sprinkle it on rice cakes along with some lettuce and tomatoes. Kale itself is very nutritious and adding nutritional yeast to steamed kale increases its health benefits. When you make salad at home, sprinkle some nutritional yeast powder over it. This makes your salad tasty and healthy. Mix it with rice or pasta dish and have it. However, if the dish contains tomato sauce, adding it may not taste as it should be. But it tastes good with the actual tomatoes. This is a simple dish but very healthy for you. If you sprinkle some nutritional yeast powder on this dish, it becomes even more healthy and nutritious. Now that you have come to know about the various health benefits of nutritional yeast, include this food in your daily diet and say goodbye to the high-fat cheese products. It has a cheesy, creamy and nutty taste and makes all your dishes delicious and yummy. Sprinkle them on pastas, popcorn etc. And you will get a taste that you will love. You get them easily in the market, both in the flake form as well as the powdered form. If you have not tasted it before, it is time that you start having it now. You will see what you have missed so long. Nutritional yeast is safe and healthy and you can have it in any of the two forms. It is a good substitute for the high calorie food items that you have. So have it and stay healthy and lose excess weight.